Hi everyone, long time no see, what's up? 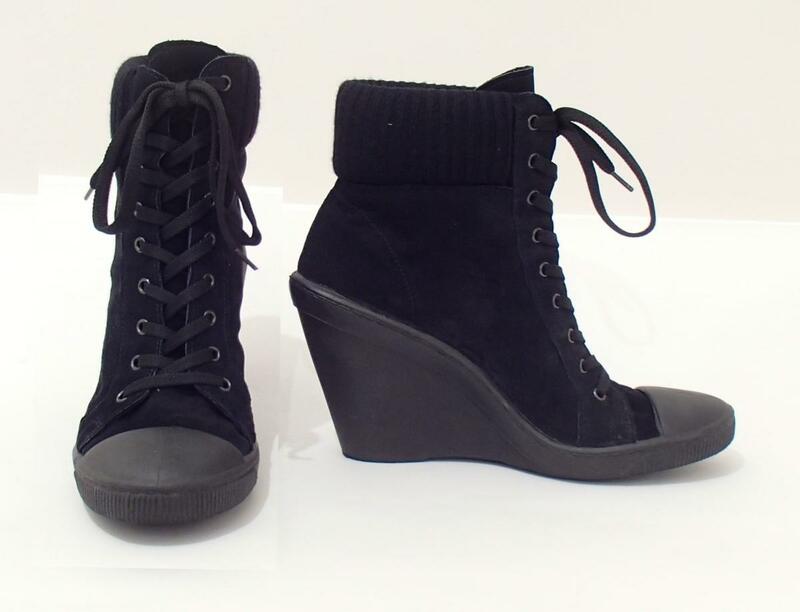 I'va managed to hassle around in heels as well, mostly have worn the black wedge sneakers I wrote about earlier. 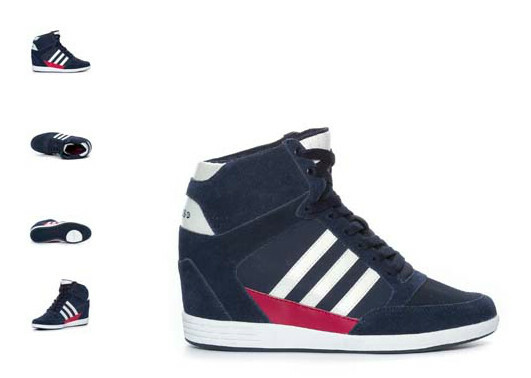 And I recently bought new pair of Adidas Neo wedge sneakers. Hidden heel is 8 cm high, still wery confortable to wear. I have something similar. Mine are more of a hi-top sneaker (aka baseball boot) than a trainer. Very comfortable to wear, in fact so comfortable, it doesn't feel like the 4 inch heel it is. The downside, is the lacing. Looks good when laced, but getting the laces tidy .... 20 minute job. If only they had a side zip! 20 minute job? must be tricky to lace, mine takes approx 2 minutes to lace up. But for the heel, mine are also very comfortable, only 3.1" heel but fine for me... I'm more like 3" guy anyway when talking about heels for daily wear. First time of lacing (they are not laced when delivered), really is a 20 minute job to do both and get the laces tidy and flat. Putting them back on afterwards, and making the laces flat again takes a couple of minutes for each foot. Because I'm always late, I almost never seem to have the time to lace them up. I should wear them more really. They are very comfortable, and very quiet. I doubt I could be spotted wearing a 'heel' while wearing them. They're very discreet. I have a pair of ankle boots that are lace up. It takes a bit longer to put them on, but I like the fact I can adjust the laces for a better fit. Well, while the lace up boots might require some time/effort, it is totally worthwhile if those boots make you feel good and confident. 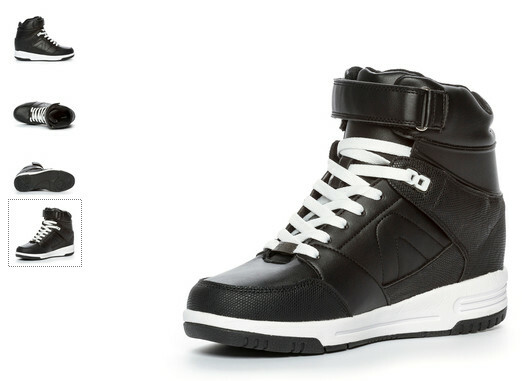 Would LOVE a pair of Nike wedge sneakers. I've not seen anything in recent years that I could use to demonstrate the look, so I may need to dig out an old 'glamour' mag. I do like the sneakers from Dinsko. Even without knowing they have a heel, they look good. I suffer from beanstalk leg syndrome as well! Not had any luck either using a search engine, nor my 'vintage' paper collection of heels. Here are a couple of looks that go some way to illustrate smaller lace spacing. Although obviously PVC, the smaller spacing on the lacing, has stopped gathering and ripples in the material when fitted to the legs. what are your thoughts to this ensemble? That is a bit weird .... But I would imagine it to be as exhilarating as you indicate. The look works for me. "Smart casual", with a heel. What's not to like? You definitely get the January 2016 Award for tener cojones. In my mind at least, I think I'm quite brave for wearing a heel in public, but you are in a whole different league. Thanks fast Freddy, when people have been drinking, they like to speak their mind which can be fun and a lot of laughs, i didnt take any of them too seriously, some were genuinely interested asking if it were to make a statement or just for fun, so I replied, just for fun. he shook my hand and off he went. I'm confident enough to edge closer to a boundary that may not have been touched many times before, but going out in knee boots with a 5" heel in the UK, especially at night amongst 'revellers' is not something I would consider anything other than dangerous. (To my health). Well, going out on my own anyway. Within a group that had accepted my dress code (never going to happen), or within a group of men who would be resistant to unfettered abuse, maybe I'd be tempted. Otherwise, not in the UK for me. Sadly. That said, Euchrid did find a Facebook 'snap' of a fella in a supermarket wearing high heels. No drunken 'yoofs' around at the time though. But fair play to him too. Who needs beer? A pair of heels lets one really grow quite tall enough - and stay sober and sensible. I sometimes wonder, if the additional height I enjoy wearing a heel, has the hidden benefit of making me less of a 'target' for potential abuse? While being fairly slim (for my age), I don't look like the sort of person who would respond well to sarcasm. (Grumpy.) With the addition of the extra height, I'm thinking disparaging remarks might usually be seen as something with little -if any- benefit. Mrs Freddy (and my walking companion) tell me from time to time, my interest in heels, will get me into trouble. Usually, they make that remark shortly after I've noticed some heels, with perhaps more enthusiasm than 'common decency' demands. Meaning, I sometimes stare for longer than is appropriate. ("Appropriate" being a momentary glance.) I'm with Frenchmen in this respect, who are known to 'stare' as women they find attractive, it being (intended) as a silent compliment. It was reported elsewhere, but I did once get called out for looking at some boots as their owner walked past, as I was seated and eating (I'm sure) some chocolate cake. A rather unpleasant remark was made by the 'jealous' boyfriend who thought his girlfriend was his property, and no-one else was allowed to look at her. He wasn't expecting me to get up, follow him, and confront him. We stared at each other, with me expecting something to kick off, but fortunately it didn't. His girlfriend pulled him away, and we both then went about our business. I am older, and less fit now. I don't suppose my responding in the same way, would be prudent thing to do again. Hopefully my additional height and 'grumpy' look, will help keep me away from unpleasantness. I sometimes wonder, if the additional height I enjoy wearing a heel, has the hidden benefit of making me less of a 'target' for potential abuse? As I am 6' 1" in bare feet (I think I've lost a good 0.5" with age! ), I can only say from experience that I think being tall cuts both ways. Yes, a tall man (but not necessarily burly or muscular with it) is likely to be treated by most people with a little more caution if abuse or other aggression is in the air. But it can also make him a target, both in the sense of being more visible and also because he might be seen as a challenge by some cocky bloke who fancies his chances with 'lofty'. On the very few occasions that I have been threatened or mildly assaulted, it has been by a noticeably shorter bloke with 'attitude'. On one occasion, Mr Shorthouse was accompanied by his girlfriend/wife (but no boots or cake involved) - it was just a case of pushing past me in a doorway whilst he was leaving a shop, and not liking the rebuke I dared to utter. He turned round, raised his fists and likened me to something essentially feminine - but seeing my stance (if not size) and that there were several interested witnesses, thought better of it and skulked off. I haven't (yet) experienced any problems whilst wearing heels. Their extra height is not really needed in my case; their potential for limiting swift and nimble movement might be an issue. The nearest I have come to experiencing grief was missing my footing whilst descending three or four wide steps as I entered a pub/restaurant, whilst wearing my 5" MJ boots. My tumble was noticed by three hairy apes sitting just inside the pub, who thought it most amusing, but I don't think my boots were spotted and I merely grinned back and picked myself up before walking (mincing?) in carefully. The nearest I have come to experiencing grief was missing my footing whilst descending three or four wide steps as I entered a pub/restaurant, whilst wearing my 5" MJ boots. My tumble was noticed by three hairy apes sitting just inside the pub, who thought it most amusing, but I don't think my boots were spotted and I merely grinned back and picked myself up before walking (mincing?) in carefully. At least you were unhurt. 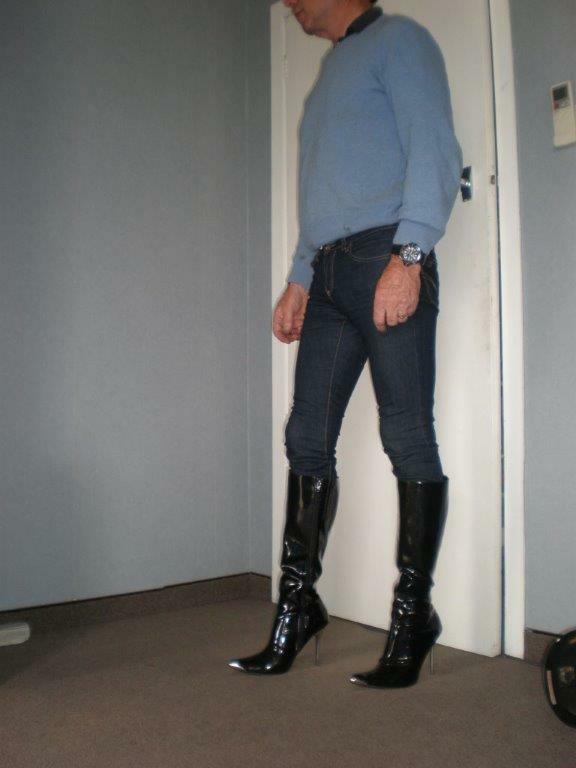 I wear my jeans long when I wear a heel. While walking, I have several times, caught the bottom of my jeans under my heel inside a shop or shopping mall. The consequence of this, is for the hem of the jeans to act like a lubricant to my heel on the smooth surface of the flooring. The resultant change in my gait is probably like watching someone tread on a banana skin. Meaning, my front leg tries to move forward at two or three times the speed of the rest of my body. Mrs Freddy has told me in no uncertain terms, if ever I end up on my arse through wearing a heel, she'll be leaving me to those who will probably be laughing at my floor bound 'adventure'. Charming eh? 1. I said 'mincing?' because, having picked myself up, I had to cautiously 'get into my stride' in the boots and probably failed to walk easily for the first few (smallish) steps. 4. I have never seen anyone slip on a banana skin (outside the pages of the Beano); does it ever happen in reality? But I know what you mean about jeans perils. I was too busy thinking about the 'tumble' and missed the 'enter' part. Makes the story even more embarrassing. Not slipped on a banana, but have slipped several times and in flat shoes, on food/organic debris left on the floor/pavement. Not sure how the banana skin legend started, maybe by Disney some decades ago?